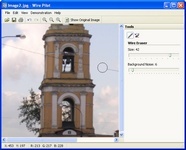 Wire Pilot plug-in allows you to retouch linear objects as well as any other unwanted objects from a photo. The program can be use in Adobe Photoshop, Adobe Photoshop Elements, Corel Paint Shop Pro Photo, Corel PHOTO-PAINT or another photo editors.Using the mouse wheel or cursor keys set the cursor size and position on the line you are about to remove so that the background color within the cursor circle matches the one of the object possible. * Using the mouse wheel or cursor keys set the cursor size and position on the line you are about to remove so that the background color within the cursor circle matches the one of the object as much as possible. * Press the mouse button to remove the line and then repeat this procedure along the corrected object. 2. Use Smart Patch to apply a patch from one area of an image to another. You can delete wires and other unwanted objects (linear or not) from a photo. Smart Patch is intended primarily for digital retouching involving a complex background. * Place the cursor on the object you want to remove. * Click and hold your left mouse button in the image, dragging it across the area you would like to remove. When the patch coincides with a background, release the left mouse button. * The tool is not available with the free Wire Pilot Lite software. Qweas is providing links to Wire Pilot Plug-in 3.0 as a courtesy, and makes no representations regarding Wire Pilot Plug-in or any other applications or any information related thereto. Any questions, complaints or claims regarding this application Wire Pilot Plug-in 3.0 must be directed to the appropriate software vendor. You may click the publisher link of Wire Pilot Plug-in on the top of this page to get more details about the vendor.